Renovating your kitchen is a long and difficult process. There are many decisions that have to be made, from the type and locations of the appliances, to the lighting design, and even the kind of flooring you want to install. Making your perfect kitchen is important as your family will spend a lot of their time there. If it isn’t to your liking, then you will be forcing yourself to be in a space that is not ideal. Therefore, turning your kitchen into the perfect paradise for you and your family should be a top priority. There are many ways to make your kitchen into your own. The structural changes of the kitchen are important, true, but those factors are not what is going to make the kitchen your personal haven. You need to change the design aesthetic of the room to accurately reflect your tastes, and there are many ways you can do this. There is a great debate amongst homeowners when it comes to kitchen flooring: which is better, wood or tile? Although there are many different options that can be used for kitchen floors, wood and tile command by far the biggest portion of the market share. As such, those two materials are often the ones that get discussed. The debate is a heated one, with many proponents and opponents of both types of flooring. Both have their benefits and detriments. Wood flooring offers many advantages, but mainly, it will have a higher return on investment than tile. If you are ever looking to resell your house, hardwood flooring is always a consistent selling point that is agreeable to almost every buyer. Wood floors also have the added benefit of being able to offer continuity throughout your house. Being able to continue your design aesthetic throughout the floor of your house is nice to be able to do, especially if you have an open-concept floor plan. These types of floors are very durable. Depending on the type of wood you choose, however, (whether it is a soft or hard wood, and how it is treated) being installed in a high-traffic area like the kitchen can cause some dents or scratches to occur. If your hardwood floor becomes damaged, it will need to be re-sanded, which is a task unto itself! Wooden floors are more expensive than their tile counterparts. They are also more susceptible to water damage. Treating your wooden floors will help stop water damage from occurring. However, a kitchen has many appliances that use water to function, and can leak at any time. Finally, wooden floors can be difficult to clean, as there can be grooves between slats that can accumulate crumbs and other debris. Tile flooring is preferred by some homeowners because it is cheaper than wood. Tile also can come in a large variety of styles, making it suitable for almost any design choice. The versatility of tile is often one of its best attributes, as homeowners can always find a tile that fits their needs. Tile is extremely durable, hardly needing maintenance throughout its life. While some individual tiles may crack or break should the subflooring fail, it is easy to replace just the one tile. Fixing a single tile is a lot less intrusive than re-sanding an entire wooden floor. Cleaning tile can be a bit more time-consuming than wood, as the grout must be treated and cleaned as well. The type of flooring you choose does establish a particular design style, however, most floors are versatile enough that they alone cannot set an aesthetic. The look of your kitchen will only be completed when you choose the perfect cabinet. There are many different types of cabinets on the market. Installing a particular style of cabinet will solidify how you want your kitchen to appear. Cabinet installation and repair is a necessary part of completing your kitchen’s look, something San Diego Kitchen Pros specializes in. The finish of the cabinets needs to align with your kitchen ideal. The color palette is an integral part of any kitchen design. As the kitchen cabinets occupy most of the space in a kitchen, their color and finish will be the anchor of your aesthetic. The style of the cabinet itself can also affect your kitchen’s style. The type of wood, whether or not the grain is visible, or if the wood has any beveling, are all choices you will have to make. 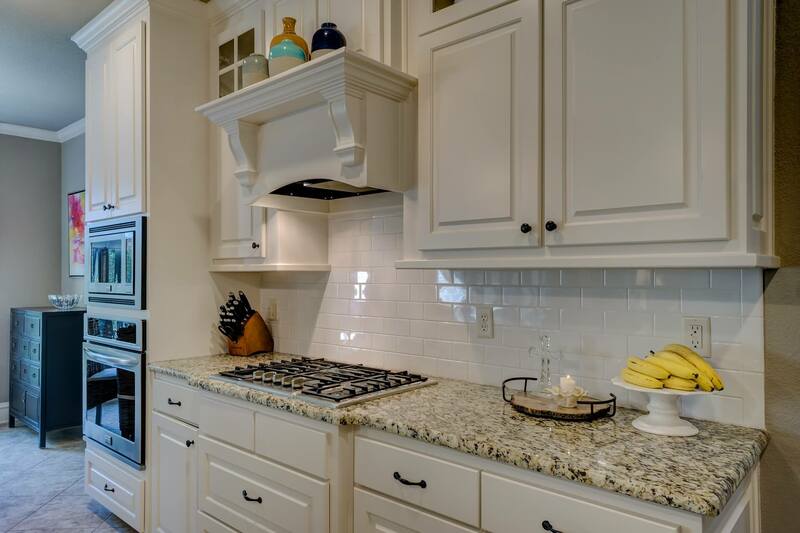 The cabinet handles are also a significant contributor to your kitchen’s look. Some homeowners may decide to leave their cabinets handleless, as they would like their kitchen to be sleek and modern. Not having any handles will play into the decluttered kitchen trend. Your can also choose to install handles that match the metal finish of your appliances. Doing this will tie each part of your kitchen together, thus completing the design in a simple and elegant way. Christine is an assistant for San Diego Kitchen Pros and she enjoys home design and remodeling. You mention when your hardwood becomes scratched that it will have to be re-sanded – that’s not necessarily the case. My floor had a bunch of small scratches in the hallway near the entrance to my kitchen. I was ready to spend a bunch of money (and time) having someone sand them out, and I did some research into it. I ended up finding a local business (https://www.nhance.com/centraljersey) that refinishes hardwood floors – WITHOUT SANDING THEM! It ended up only taking a day for them to come in and remove the scratches. Just something to consider when weighing hardwood against tile – that sanding isn’t the only option out there.